The latest and greatest version of the wholesale catalog is now available, which includes brooches, ornaments, cards and prints. Please email me for the link (retailers only, thanks!). After weeks of fine-tuning and tweaking, I now have a selection of six brooches and six ornaments available. 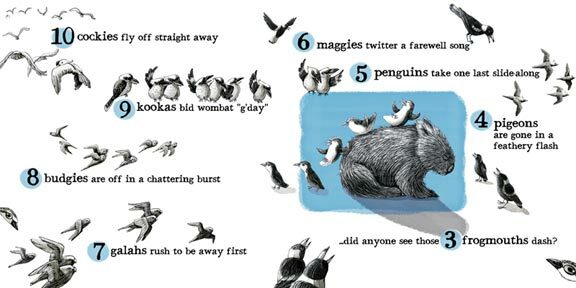 Brooches include the frogmouth, crested pigeon, boobook, bilby and two nests. 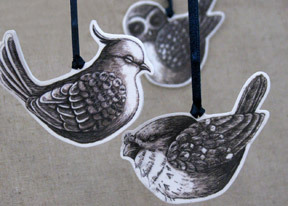 Ornaments include the kookaburra, fairy wren, barn owl, boobook owl, frogmouth and crested pigeon. Each ornament and brooch is signed and dated on the back and sealed with a UV- and water-proof acrylic spray. Ornaments are finished with a satin ribbon and the brooches are made using high quality snag-free brooch-backs. Both are packaged using recycled card stock. These are currently available on Etsy and hopefully at markets and shops soon. Although I have not updated the catalogue yet, these items are now available for wholesale (please contact me for details). I just wanted to let you know about two new lovely galleries that will be carrying my work in Victoria. Acme Et Al. is located in Yarra Glen and is “a photographic lab, communication studio, gallery and store with a synergetic collective of like-minded people.” Impress Tea House and Gallery is located in Elmore and is a place to purchase fine teas and all things related to tea. If you’ve never been to the Finders Keepers website, you are really missing out! Not only do these ladies host fantastic art and design markets, they also have an amazing collection of interviews and galleries of artists and designers from across Australia. I was lucky enough to be featured on their website last week. 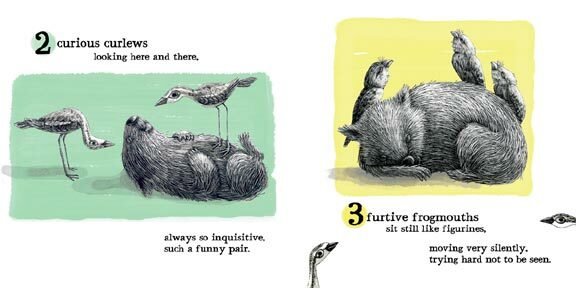 You can read the interview (and peruse all the other gorgeous art and design) at The Finders Keepers. Enjoy! After months of treatment for breast cancer, I have finally gotten back to work! Here is a peek at some new products I have been developing. Ornaments and brooches will available in mid-September — just in time for the holiday season. I am transitioning all of my prints to a new eco-friendly paper so all of my prints made on Epson Watercolor Paper have special lower prices on my Etsy site. 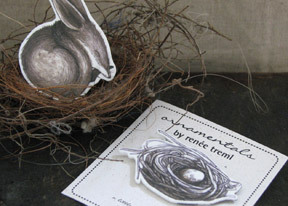 Please visit Renee’s Artwork on Etsy for availability, prices and sizes. I have just updated my wholesale catalog with new products and prices. All of my prints are now made on sustainably produced eco-friendly paper, and as usual, my notecards are made on recycled paper with recycled envelopes. Please contact me at ReneesArtwork[REMOVE]@gmail.com for a copy. Note: available to resellers and retailers only. Foxes of Fancy has recently opened in Mosman Park, WA. This new shop is “eco made fabulous” (they couldn’t say it any better!) and features gorgeous sustainably produced Australian art, homeware, fashion and more. The shop is run by two designers, Stacey and Marianne, whose studios also share the space. They are currently stocking some of my limited edition eco-prints in addition to all of their other beautiful products. You can check out their products online or in person at 616 Stirling Highway, Mosman Park. Just a little note to say that all nine bilby angels were delivered to Artisan (m)Art last month. I created these angels to bring attention to Australia’s bilby (a desert-dwelling marsupial) which is listed as endangered in Queensland. I gave each bilby a unique personality and a pair of wings to help protect it from the feral cats and foxes that threaten their survival. 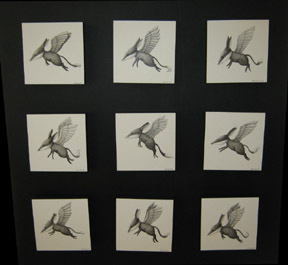 Each angel is an original scratchboard illustration created on a square of clayboard. I mounted each clayboard onto an Australian-made black frame, giving it the impression of a mounted tile or unframed canvas. You can see some of the angels in better detail here.